I first encountered Tal’s playing when I was channel surfing and came upon Eric Clapton’s Crossroads Guitar Festival concert in 2007. She was playing bass behind Jef Beck and took a solo which blew the crowd (and me) away. I found other footage of her on YouTube playing with Beck at Ronnie Scotts and learned about her work with Beck, Clapton, Chick Corea, Herbie Hancock, Wayne Shorter and many others. Her chops are prodigious and I hoped to see her live one day. Tal at the Sweetwater lived up to her reputation as a virtuoso bassist with all the chops and more. She played a few covers, including John Hiatt’s Slow Turning, the Smith’s How Soon Is Now?, and was joined onstage by Heartbreakers drummer Steve Ferrone for a Tom Petty tribute of his You Wreck Me. 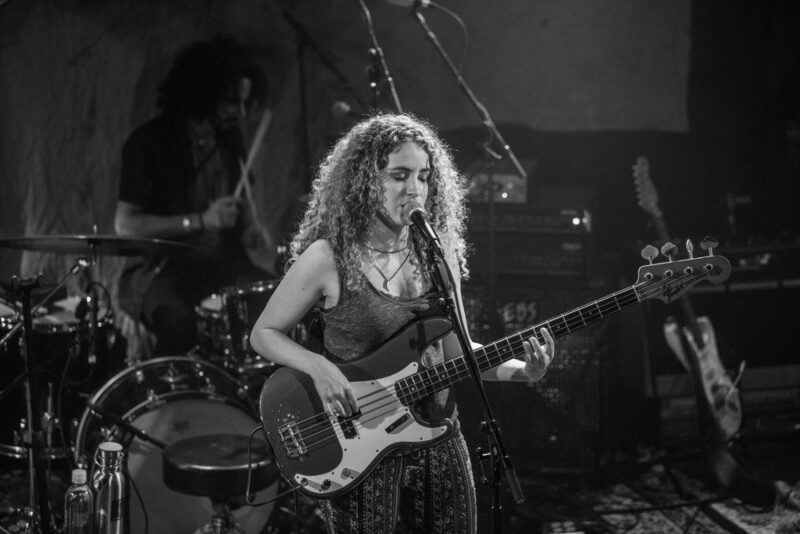 Her bandmates, both introduced as “musician number one” – Tamir Barzilay on drums, percussion, vocals, beats and other electronics, and Owen Barry on guitar, vocals and bass – each provided a complementary soundscape for Tal’s playing and lead vocals. Tal’s writing is complex and steeped in jazz, with varying time signatures – this is not a pop music writer – which made the set list interesting and provocative. Her vocals are solid although not spectacular, and her one flaw is a lack of stage presence or an evocative persona when singing. She was passionate about the material, I just longed for a deeper emotional connection during her vocals. I’m guessing her performance will mature as this 30 year old does. Tal had great interaction with the audience between songs and repeatedly praised them, and remarked on how good the venue sounded, thanking Mike on the mixing board. The audience was engaged and appreciative, enjoying her personality and the banter, and Tal was having a lot of fun, which made for a great night overall. Jimmy Dillon, with Eric McCann on bass and Kirk Snedeker on drums, played a tight opening set and got the crowd swinging, especially after a bomb of an opening 10 minutes by comic Jamar Neighbors. Introduced by Tal as a good friend and one of several comedians who helped her through a tough year when 16 of her friends died, Jamar’s set fell horribly flat and was painful to experience. Hope the rest of his tour was better. This entry was posted in Musings and tagged Live Show, Music, Musings, Tunes.